What ended the Great Depression? Christian Romer made the case in a famous article that it was FDR’s unconventional monetary policy–not sterilizing the gold inflows from Europe and devaluing the dollar in terms of gold–and not fiscal policy that ended the Great Depression. More recently, Gauti Eggertsson argued it was not unconventional monetary policy itself but rather a change in expectations from a number of policies that ended the Great Depression. His view is that FDR’s monetary and fiscal policies changed deflationary expectations to inflationary ones and in so doing got nominal spending going again. While Eggertson explanation is intuitive, it goes against Romer in arguing fiscal policy mattered too. It also makes a provocative claim that the National Industrial Recover Act (NIRA) played an important part in ending the deflationary expectations. The implication, then, is that any immediate output loss generated by NIRA cartel and monopoly-like policies was more than offset by the increase in output generated by the change in inflation expectations the NIRA helped create. Eggertson’s paper provides a clever but controversial interpretation of this period. And Steven Horwitz is not buying it one bit. He has a new article in Econ Journal Watch that questions Eggertson’s paper. He specifically says Eggertson has his basic history wrong for this period and thus his DSGE model–the source of the paper’s findings–has little merit. 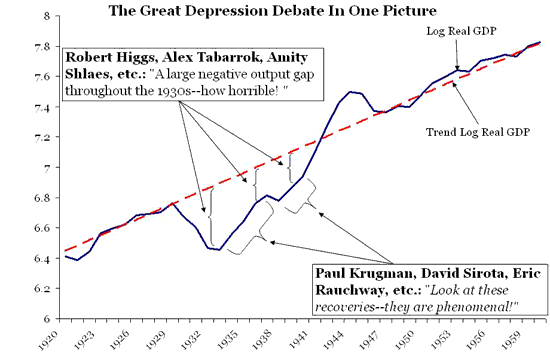 Horwitz paper is interesting and is sure to rev up the Great Depression debate once again. In case you missed this long-running debate in the blogosphere here was my past attempt to summarize it.